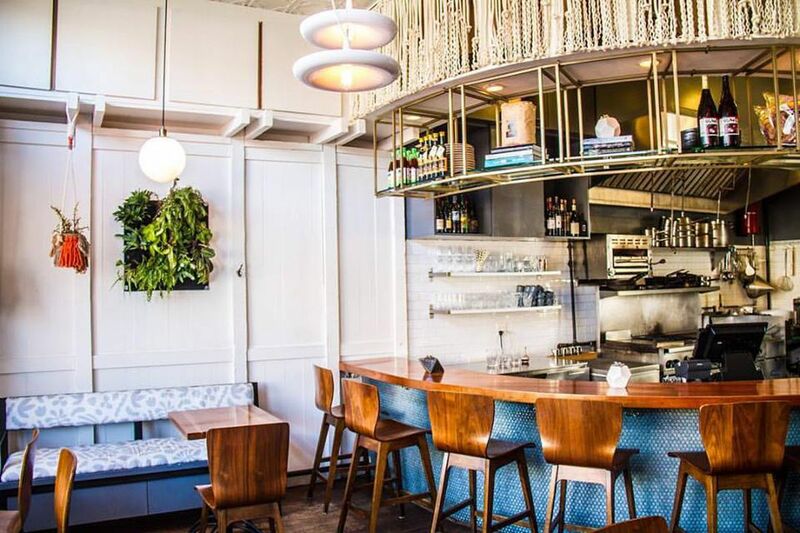 Himitsu is a Japanese-inspired restaurant combining freshness, acidity and herbs, leaning heavily on Latin American and Southeast Asian flavor profiles. Reservations are not accepted in this tiny 24-seat restaurant, so be prepared to wait in line. Seating is based on a first-come, first serve basis, for parties of 4 or less. They will also take names and numbers and send a text when your table is ready. Closest Metro is Petworth. We took advantage of the freezing weather on this holiday and headed over to Petworth fully prepared to wait in line. As soon as the doors opened at 5pm, we only waited another 15 minutes before being seated at the bar. The barman was friendly and immediately took our drink order. I ordered a glass of 2016 Empire Estate, Riesling from Finger Lakes, New York. It was acidic and right up my alley. Keith ordered the Chufly - a Bolivian cocktail of Rujero Singani, lime and ginger. His drink was more ice and liquid, but a refreshing start to the evening. We were told the menu changes slightly each day and were recommended to order one dish, per person, per section as each dish is small for sharing. 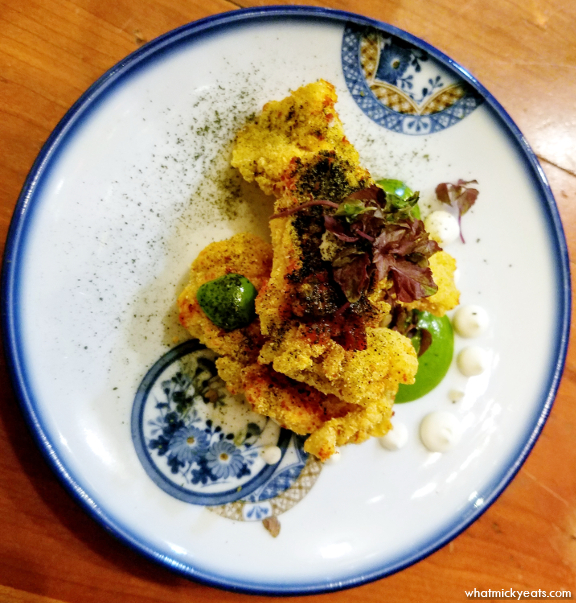 From the 'snacks' section we started with Sapidus Farm Oysters that were cornmeal fried, and topped with chili-kosho lemon crema, garlic-spinach pureé and fermented spinach powder. Surprisingly the chili on top were incredibly spicy, but the oysters themselves were creamy and delicious. 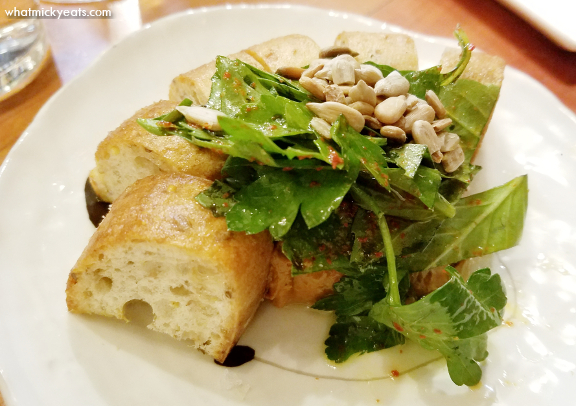 Next we shared the Nduja Paté of spicy chicken liver mousse topped with sunflower seeds, lemon, basil, parsley and served with sliced baguette. Again, the heat factor was strong! Keith was shocked I could hang - but the heat in the back of my throat was not that bad. The pate was incredibly smooth. I think the green salad on top held most of the spice, but the sunflower seeds provided a nice crunchy and nutty juxtaposition. 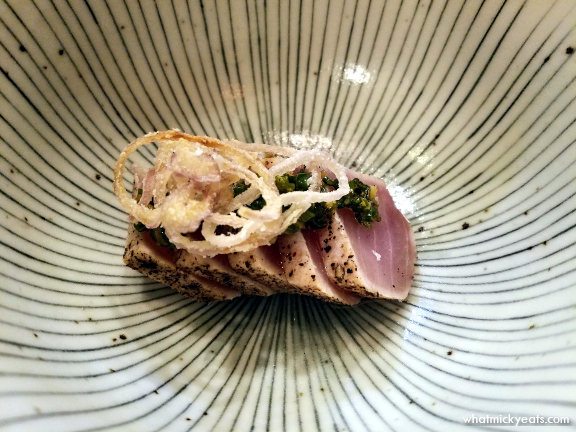 From the 'cold' section we tried the Maguro tuna that was slightly seared, served simply with soy sauce and fried shallots. This had a very clean Japanese profile, and was a nice break from the first two spicy dishes. The chef-recommended Sugi really stood out to me. It featured lemon fish topped with red onion and Thai chili tossed in coconut milk, and served with cured squash with lime juice and peanuts. The bright flavors were straight from Thailand and were more sweet than spicy. I loved it. 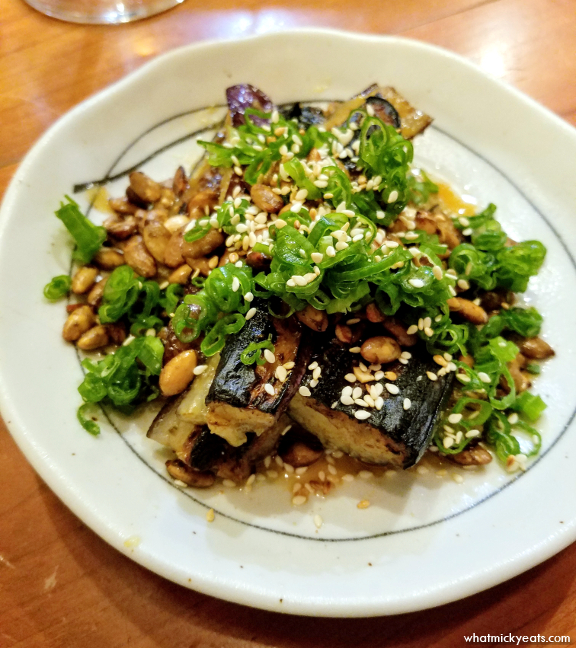 From the 'hot' section, we ordered the vegan Nasu Dengaku - grilled local eggplant in a yuzu-miso chili-lime vinaigrette, topped with sesame seed, candied pumpkin seed, and scallions. The eggplant melted in my mouth and was very comforting with its umami profile. With this dish, Keith ordered the Kalimotxo - a Spanish drink of red wine mixed with Mexican Coca Cola. It reminded him of cherry coke. 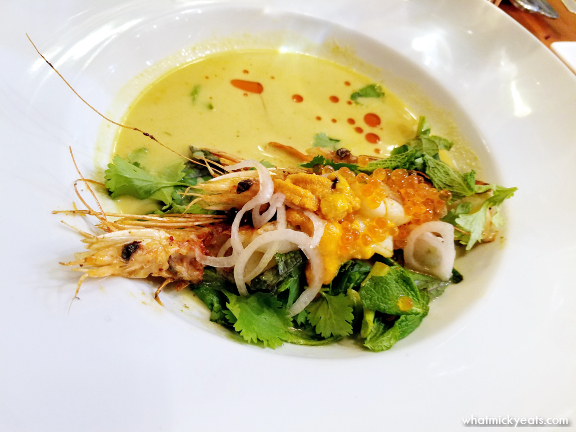 Lastly, we shared the Kare Ebi - Gulf Coast Shrimp topped with uni in a Thai-inspired green curry with pea leaves and trout roe. The spice in this dish was forward on the tongue and balanced out a bit with some added white rice. The shrimp were tender and sweet. The added uni and roe gave each bite a full taste of the sea, which was lovely and seductive. With this dish, Keith drank a Free Room that was balanced and aromatic with bourbon, lemon and honey with a float of Fernet Francisco. Overall we had a great fun meal at Himitsu. Though the dining room is small, we got a seat with hardly any wait and service was attentive all night. The set up of the open bar and kitchen was fun to see, but the smoke was overpowering (expect to leave with smelly clothes and hair). While cocktails were creative, the prices were a bit high which reflected with some sting on the bill. 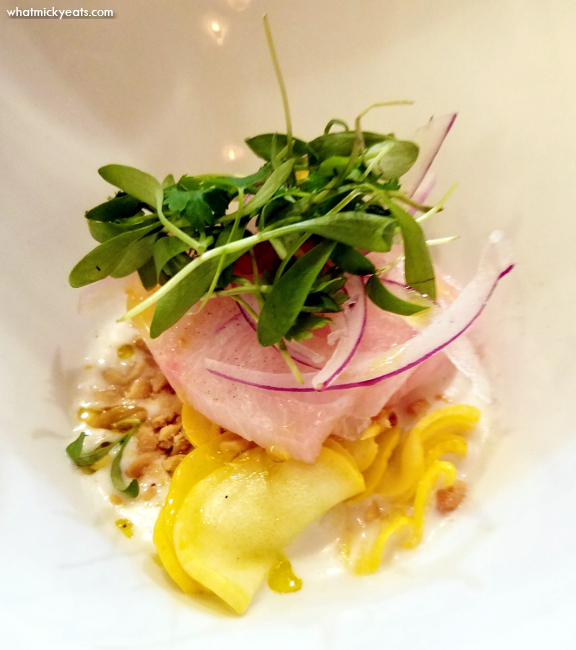 Nevertheless the quality of ingredients and appreciation for locally sourced items was apparent and a main highlight celebrated throughout each dish.